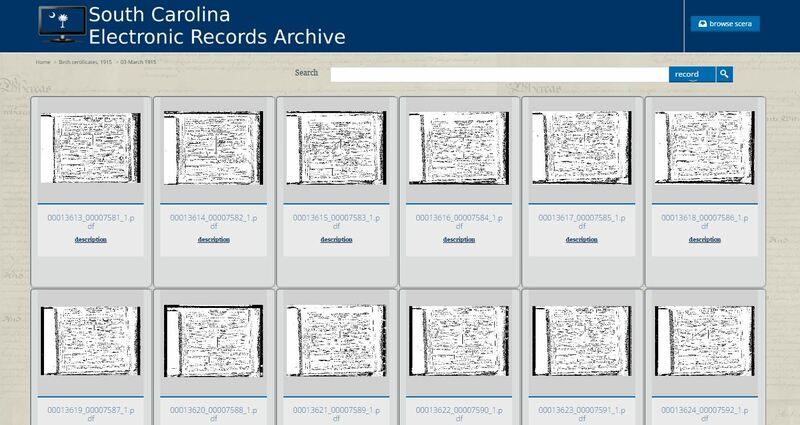 Use the South Carolina Records Archives (SCERA) to search for your ancestor by name. Enter the name in the search field at the top of the page. 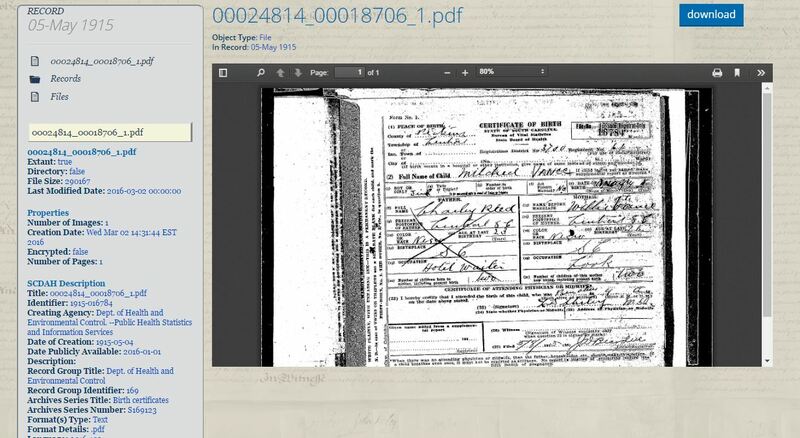 We wanted to see how many Vances were among the 1915 birth records, so we just searched using that surname (Vance). 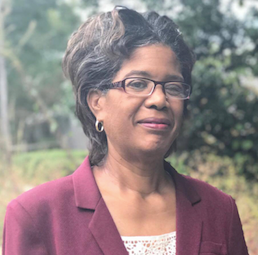 South Carolina, Department of Health and Environmental Control. 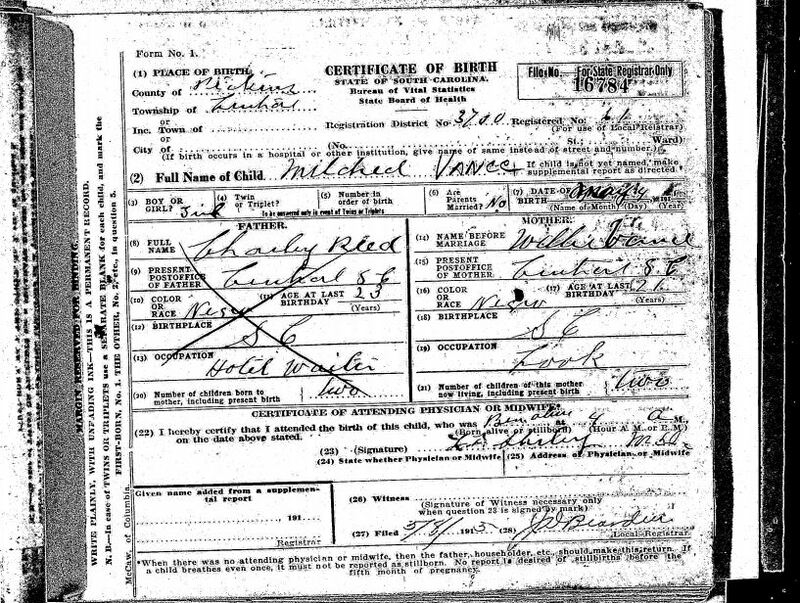 Birth Certificates, Series S169123, Birth Certificate for Mildred Vance, South Carolina Records Archives, http://e-archives.sc.gov/file/sdb%3AdigitalFile%7Cd34cf080-8993-40e1-b9d9-61a0f85e1727/ , accessed 12 Aug 2016. If your ancestor was born prior to 1915, chances are they applied for a delayed birth certificate. 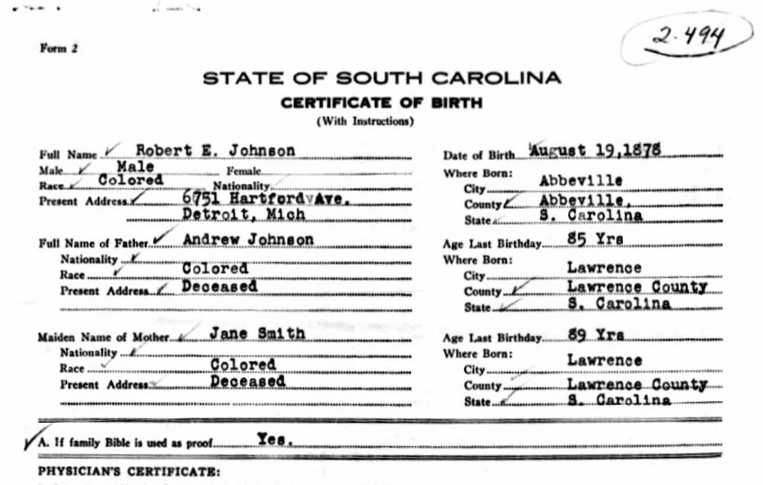 Even ancestors who were born in South Carolina and migrated to a different state commonly applied for a birth certificate. Search South Carolina Delayed Births, 1766—1900 and City of Charleston South Carolina Births, 1877-1901 at Ancestry.com. In the following example, Robert E. Johnson (b. 1878) applied for a SC birth certificate while living in Detroit, Michigan. It includes the names of his parents, age at last birthday, whether they are living or deceased, and their place of birth. In the next post, we will share other records that can be used in place of birth records. Search the databases suggested in this post to find your ancestor’s birth. Share ways you have documented the birth of an ancestor on the Facebook post for this article.